Today is RELEASE DAY – YEAY!!!! On Sunday you got the chance to meet Charissa. In case you missed it, you can find the post here. On Monday I told you about the first book I read, Between Hope and the Highway. You can find the post here. Yesterday I told you all about the first book in this series, Game Changer. In case you missed the post, you can read that one here. Today is the day I get to gush all about this beauty Package Deal. I loooooovvvvvveeeeedddd this one!!!! I’ve read it twice so far, and will probably read it again soon. To win a copy of the book, you need to like both Charissa Stastny’s Facebook Page and My Facebook page . 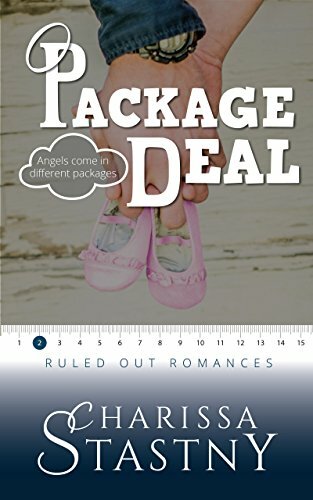 Then you need to share one of the posts during the week and comment on why you would like to win a copy of Package Deal. You can share and comment on more than one post. It’s as simple as that! Single mom Spring has no desire to date again. At her best friend’s wedding though, she is surprised when a handsome man’s flirtations charm, instead of annoy her. But when her toddler runs up and calls her Mommy, she can tell by his reaction that her daughter is a deal-breaker. He can’t escape fast enough. Hudson Sandel proudly owns his bachelor status as he attends his little brother’s wedding as best man. Too bad the only woman who tempts him there has a daughter that rules her out. Instant fatherhood will never be on his agenda. Yet when the kid throws a tantrum, he swoops in to help keep her from ruining his brother’s special night. When he leaves though, he can’t get the gorgeous blonde out of his head. Playing hero to her child made him feel uncomfortably good, and he doesn’t know quite how to feel about that. As fate, lollipops, and toddler tantrums keep throwing the angelic duo into Hudson’s path, will he risk his heart and dreams on a package deal, or stick to the sure road leading to professional success and glory? Hearing the photographer’s high-pitched call, I realized the wedding party had moved on without me. As my high heels sank into the dewy grass, I winced and rerouted to a paved brick pathway lined with ornamental shrubs and capped with a wooden trellis full of tangling vines. The scent of honeysuckle filled the air, and I paused for a moment to inhale the sweet scent. When I looked up, an attractive man in a tux leaned against a nearby pillar. He was tall, and had a sleek, yet powerful build that reminded me of a panther in his tux. His dark hair was cut short, and he had a clean, flawless jawline I found appealing. Most guys now days were so scruffy. Not that I was in the market for a man. But I appreciated quality when I saw it. He glanced up at the staccato beat of my heels on the bricks, and our eyes locked. I wasn’t close enough to discern his eye color, but his dark lashes and brows rendered them striking whatever hue they happened to be. He raised both brows, as though asking me a question. The stealthy panther in a tuxedo fell in step behind me, and I wondered about his identity. He must be Jeff’s best man. But was he an old college roommate? A childhood best friend? He couldn’t be the idiot brother. He looked nothing like Jeff, nor did he appear to be a faulty wire waiting to spark trouble. As a breeze caressed my exposed skin, I became hyper aware of the plunging back of my dress. What I did in the name of friendship. As he situated himself behind me, I caught a whiff of expensive cologne. When he leaned closer, goosebumps erupted as his minty breath washed over my sensitive ear and cheek. I shivered from the sparks shooting through my body. “Spring,” I replied as I tilted my head to peek at him. “Eyes on me,” the photographer ordered. I returned my focus to her and tried to ignore the way my hair follicles reacted to the slight friction between our arms. A quick glance at the two bridesmaids laughing together at the side made me wish I could trade places. His lips curled into a sneer that made her huff. I bit back a grimace, hating how she ordered us about by our wedding day titles. She stepped up to shift my body so I pressed against the man’s powerful thigh. Positioning my hands on his arm, she tilted my head into his shoulder and stepped back to appraise us. My skin burned as I felt his intense gaze upon me. Why in the world was she taking so many shots of us? Shouldn’t she focus on the bride and groom? I couldn’t help but blush as I leaned closer. He smelled divine. Maybe I’d have to ask him what cologne he used. But that would require talking to him. I wasn’t brave enough to do that. My cheeks and neck grew hotter. I bit my lips, wishing we were done. I clenched my teeth, but managed to force what she considered a real smile onto my face. He snorted. I guess that was a no. “Oh, we’re not a couple,” I hurried to correct her. I whipped my head around to stare at him. “I’ll be quick.” She positioned me in front of Hudson, and had him wrap his arms around my waist and tilt his head into my hair. As his breath tickled my neck, my heart began to pound harder than a herd of elephants. I heard the camera shutter clicking, and hoped we were almost done. The way my body reacted to his touch made me want to flee. I chewed my bottom lip as I raised my hands to rest on his tuxedo. As his fingers brushed the bare skin on my lower back, I could hardly breathe, let alone think of something to say. “You know,” Hudson said in a rich baritone, “it’s a low-blow to upstage the bride at her own wedding.” He winked, and I felt my skin burn in another embarrassing blush. He nudged my chin up, and smiled. I blinked several times, wondering if I was seeing things. His smile transformed him. Whereas he’d appeared intimidating and unapproachable before—dangerous even, like the panther his body called to mind—his smile made his striking green eyes crinkle at the corners, rendering him younger and friendlier looking. Totally disarming. Charming. The wool-silk blend of his suit rubbed against my arms, and I trembled. Package Deal is a book about two very broken people that fall for each other. And then if that isn’t complicated enough, Spring the single mom in the story has a cute little daughter to add even more complication to the tale. I loved the humor, romantic tension and witty banter in this book. Hudson is dreamy, yet has such real flaws you cant help but fall for him. Spring went through hell and came out broken but strong. And through it all she hasn’t turned bitter, she’s just cautious. Watching these two fall in love, and seeing them face the problems of that with a toddler in the middle was such a page turner. I lost a lot of sleep devouring this book. Stastny once again brought an excellent read that had me lost in the story and sad to let the characters go once I finished the last page. To say I’m excited for the next book in this series would be a mayor understatement. Few have the ability to deliver such a fun, witty, swoon worthy book without being overbearing in one way. Satstny has perfect balance of all elements in these reads, making them memorable long after finishing them. Charissa Stastny is married to her high school sweetheart and has four children who are the light of her life. She’s an avid reader, happy writer, BYU graduate, and lover of poppies and irises, clouds, chocolate, sushi, and nature. Though born and raised in Las Vegas, she has never pulled a handle of a slot machine and can’t shuffle cards to save her life. She shuffles kids, laundry, and church responsibilities rather well though. She currently lives in Utah with her family, where shuffling cards isn’t required. I’m so glad you loved it! Thanks for helping me by reading it over twice. Your feedback was invaluable in making it shine. Hope to return the favor for you and switch roles when your book comes out.